There was scrimshaw, of course. 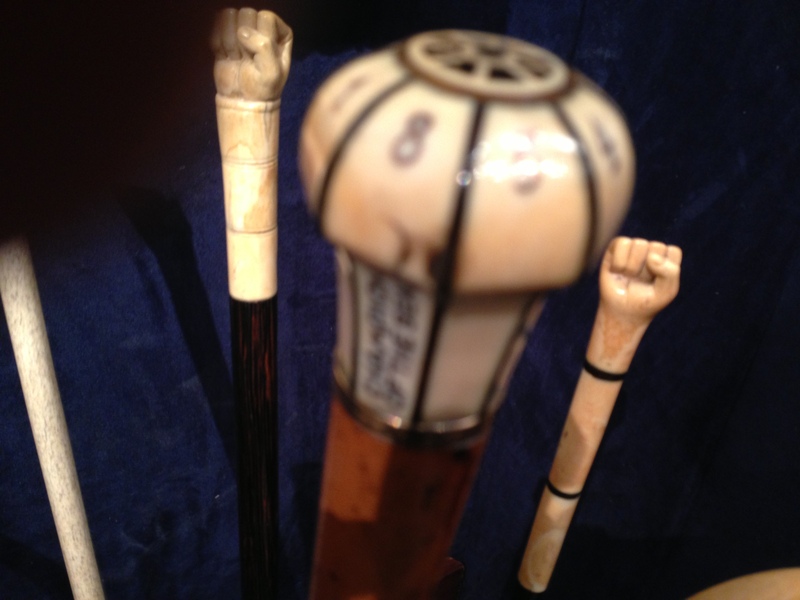 In all its various guises, carved on the plank-like jaw of a whale or sculpted into curio-style walking stick tops. The 59th Annual Winter Antiques show had art from around the world and of every vintage, from the ancients to the ‘60s. 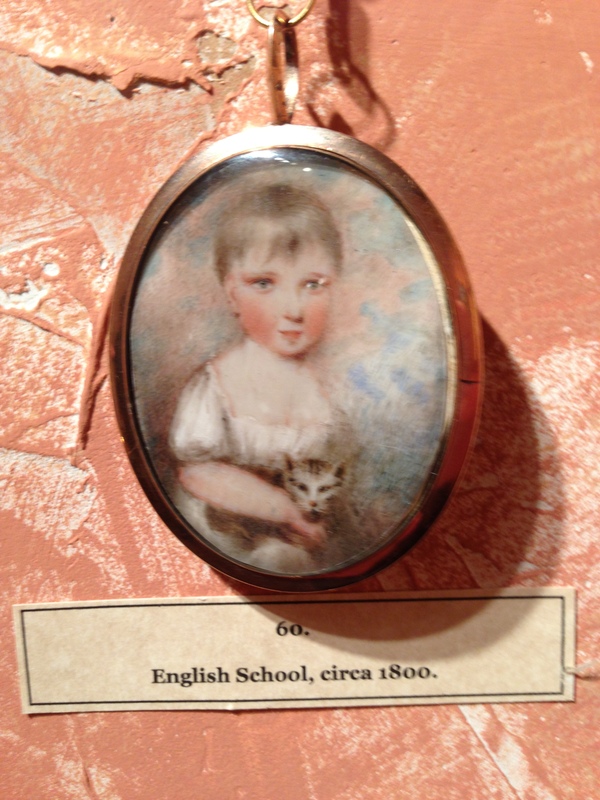 My friend Suzanne and I inspected miniature portraits, some with locks of hair tucked into secret locket pockets. It was the story that drew us again and again, not the craft of the piece, which could be exquisite but nonetheless leave you unmoved. 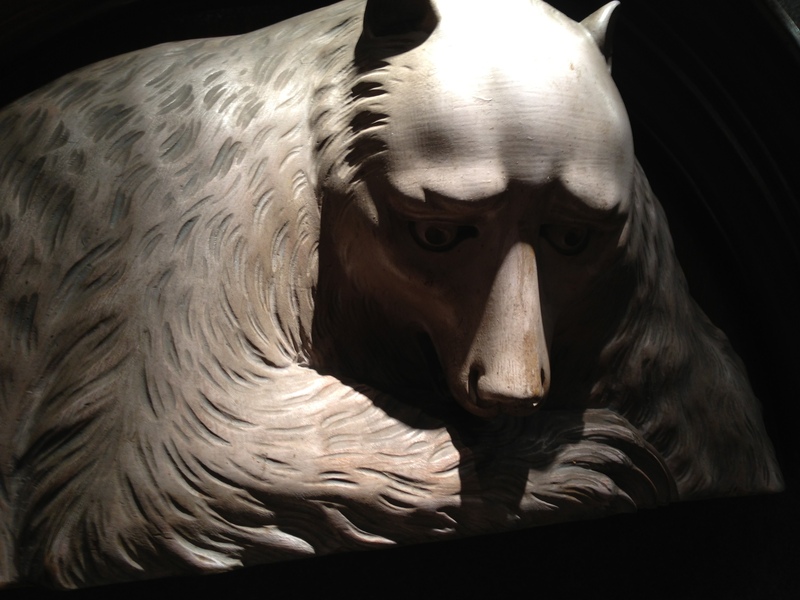 I loved the moth bitten tale about the grizzly bear of carved wood that once graced the top of a doorway in northern California, the entry to a masonic lodge. 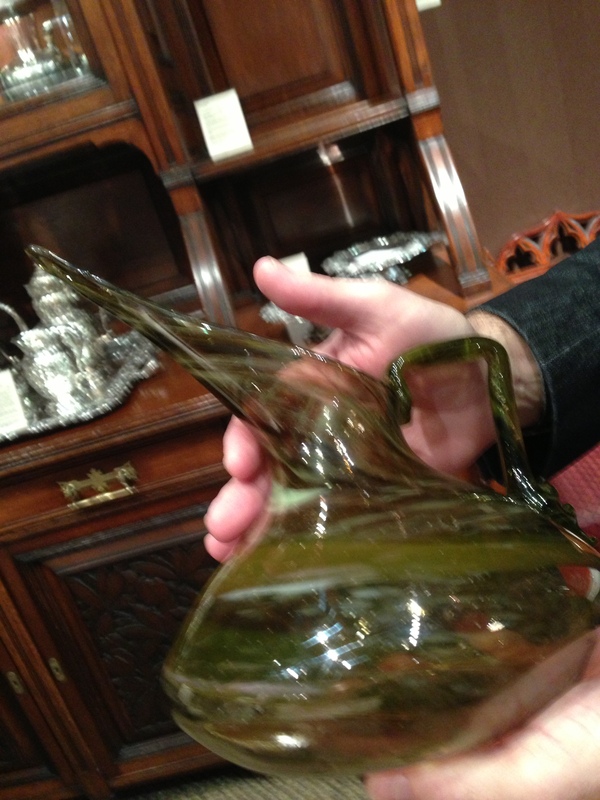 Made in the mid-1800s, it was a highly unusual find (and was looking for a highly unusual collector to take it home). We came upon a colonial-era painting that showed two ladies seemingly snuggling – “The Lovers.” was written in script across the bottom. 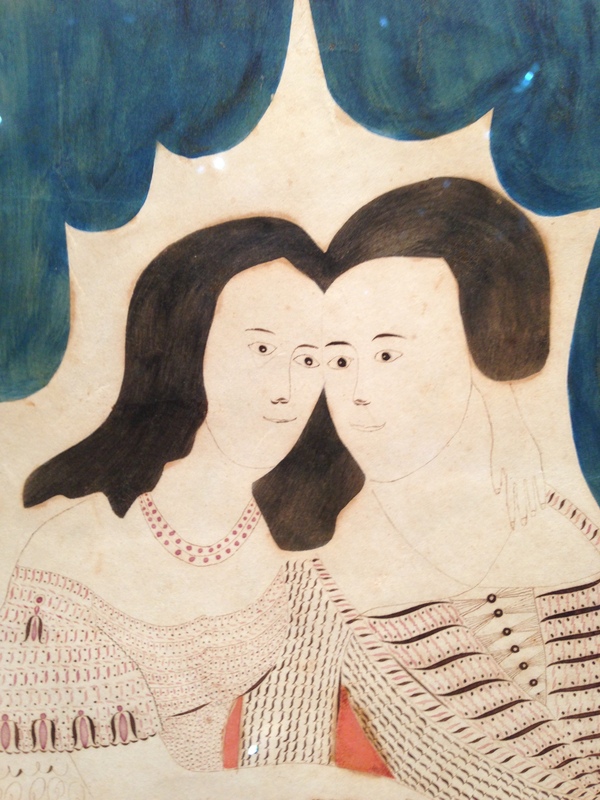 A similar trope was visible in a tiny twin cameo on a gold ring, with the two female faces etched in milky glass. It dated from Rome in the time of the Caesars. Who were the women, mother and sister? Two darling daughters? “The Lovers”? You write the story. 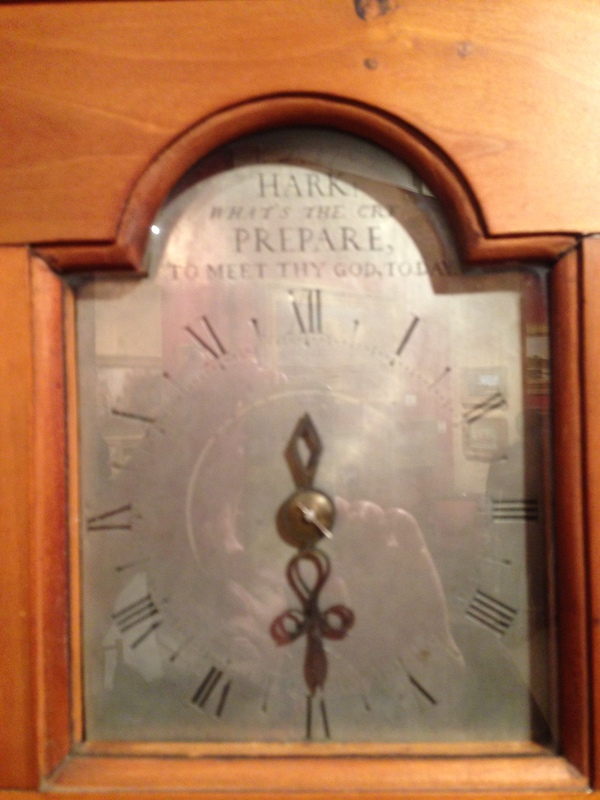 A tall, plain clock made in a family woodworking shop in East Hampton, practically unvarnished, admonishing admirers with its stern legend, was displayed in a stall run by a family business called Delaney Antique Clocks. Two centuries ago the clock was created for by a sea captain who had lost five children under the age of five. Hark, What’s the Cry: Prepare to Meet They God, Today. 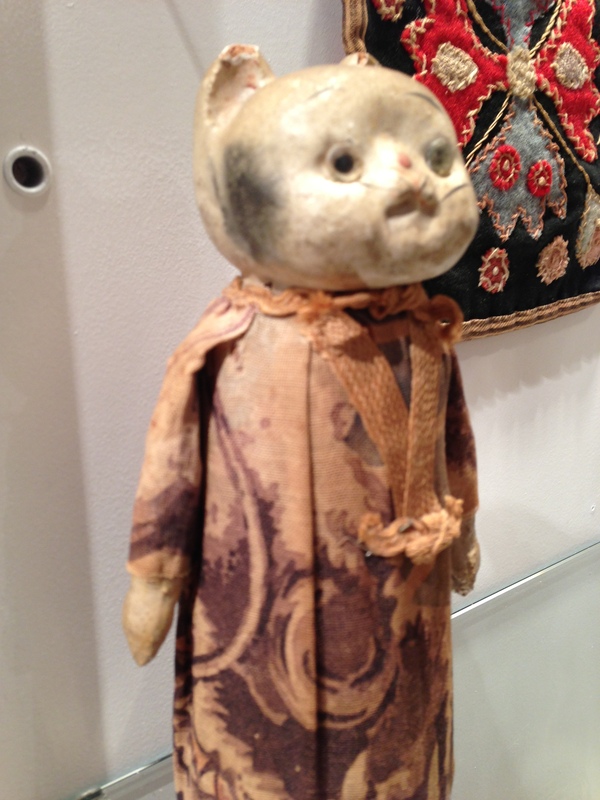 Then there was the cat-head doll. We used to tell terrifying stories about such creatures when I was a child. Was this a voodoo doll of sorts? 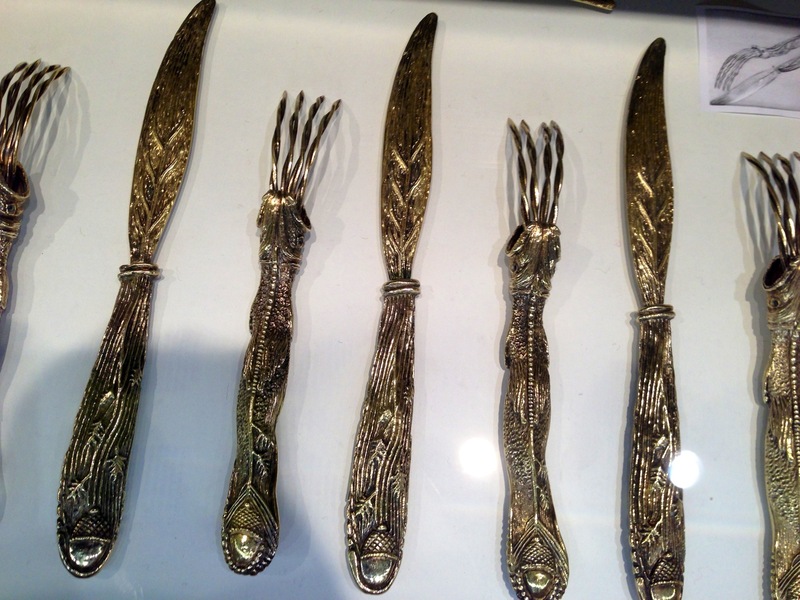 Also a bit fierce, a set of Salvadore Dali-designed silverware, with forks like retractable claws. 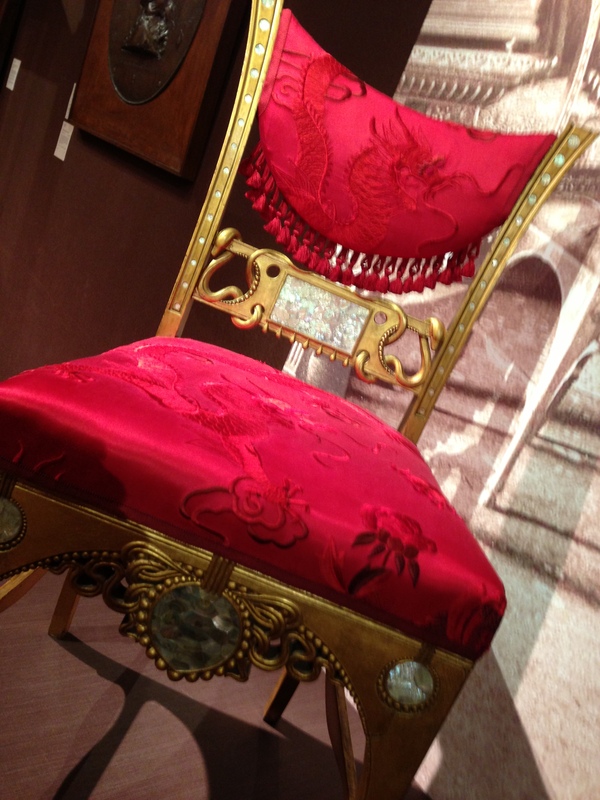 At the booth run by the expert David Parker, for the enterprise called Associated Artists, we saw a striking, red satin chair atop a platform. Here was a story. Crafted of gilded maple, the cloven-footed, serpent-entwined chair was a jewel in the living space of the tycoon William H. Vanderbilt, whose residence on Fifth Avenue at Fifty-first Street was the most magnificent home in America during the Gilded Age. The house was also the crowning achievement of Herter Brothers, the most important furniture makers/interior designers of the era. The Herter chair appeared in the self-published Mr. Vanderbilt’s House and Collection, which documented the great man’s stuff for all the many people who might not ever get inside the house to take a look for themselves. Circular mother-of-pearl accents on the chair reflected the just-come-in electric lights that only the very wealthy could afford. 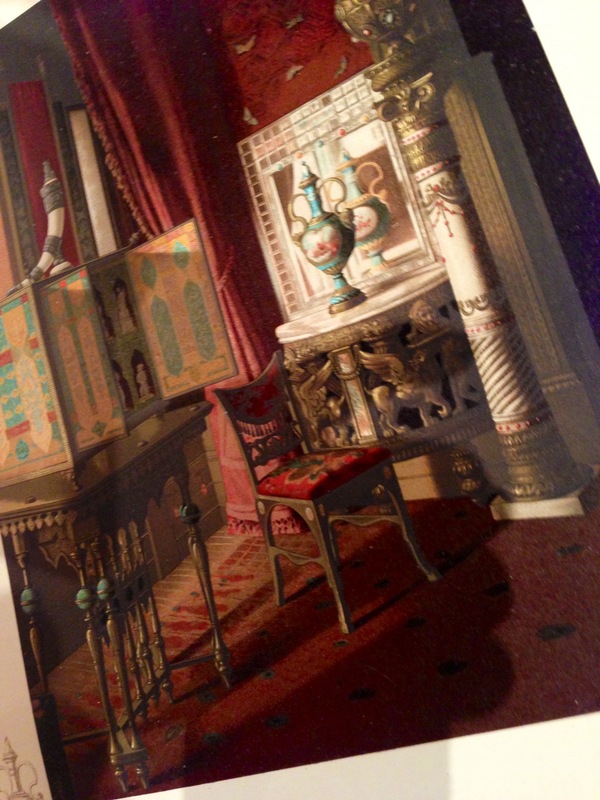 The chair also found a place in another book about the houses of the rich and famous, Artistic Houses, of which only 500 were published in the early 1880s. Andy Warhol owned a copy. Also on display at Associated Artists, a vase designed by Christopher Dresser that in its particular angularity suggests Dresser’s preoccupations as a botanist … he was famous in the latter part of the nineteenth century, a polymath and household name among the intelligentsia, though only the favored few remember his story now. We knew it was time to leave the land of William Morris carpets and genteel pillboxes and good, old stories when it suddenly turned six and all the many collectible clocks in the place chimed… not in synchronicity, mind you, but all just slightly off, one minute at a time. Thanks to you both for your comments. I try to simply be there to experience whatever I come across — if I can capture it in a picture (sometimes blurred, I hope artfully!) fine, otherwise with words. Lori’s comment expresses my own reactions as I admired the account of your browsing . Afterward, I googled the Bob Dylan (cryptical) song and read some interpretations of the lyrics… She Belongs to Me (but obviously not). Thanks for another informative visit with you… every one opens my eyes. Your blog entries are so intriguing! Did you take the photos yourself? The odd angle of some of them gives me the feeling of actually being there, of seeing these things for myself. Some of the photos are sharp and clear, some are slightly out of focus, and they put me in mind of the way we remember things in our lives: some things we remember clearly, some are a bit fuzzy ’round the edges. Your take on what you see and do really takes me out of my world and gives me luscious glimpses of yours. Thank you.